January 1, 2013 / P.J. I hope everyone had a fun and safe New Year’s Eve. Remember — lots of water will help you with many issues from a night like that! And like that, 2012 is behind us. With 2013 now in the picture, may your year be full of birdies, aces and, of course, chains rattling. We’ll continue to grow as well and hopefully do it with all of you! For about the past week, we’ve also been holding a series of large giveaways. The prize packages, I think, are truly awesome. We had many entries for each contest, which is always good to see. We have more things to give away and plan on doing it soon. For now, let me announce the winners. For those who won, please e-mail me (address is below) with your full name (if not used for the entries), and address so I can get this stuff sent out to you! Let’s get to the winners! What a great set of prizes this is, eh? The winner is — Morgan Kelly, who was selected among all the entrants via Random.org’s randomizer! Congrats! Get me an address so I can send out the package! Before moving on, however, I want to share my personal favorite story as I think really goes deep in disc golf history. Though he didn’t win this giveaway, I have to give many props to Kevin on this story. How cool is this? I had just finished a round at my home course, Gordon Bennett Park in Orlando, Florida. I’m sitting at the covered table next to the basket at 18 and Ken Climo and Nick Sartori pull in for a round. Nick opens up the back of his van and I buy a yellow DX XD with Ken’s 2-time world champion stamp for $5. Since Ken was standing there, I got him to sign it for me. I put it in my bag and then Ken, Bob Lewis and I go play a round. That disc has never been thrown and is hanging on my wall today. 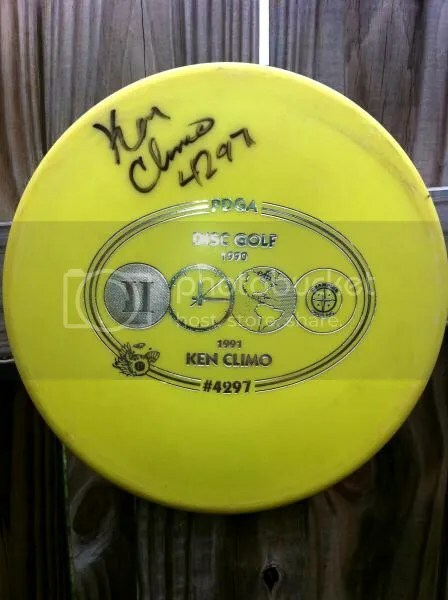 It was the only autographed golf disc I owned until last summer and going to the 2012 World’s in Charlotte. How cool is that? Thanks for sharing the story, Kevin! Look at all these awesome Vibram items! The winner is — Stan F, who was selected via Random.org’s randomizer! Congrats! Get me an address so I can send out the package! Donnie Brooks is one of the most selfless disc golfers I’ve ever met. He truly loves the game and is the man behind the Mini Disc Golf Federation. Having personally met Brooks, I can assure you he doesn’t feel the need to be in the spotlight. So, despite him not winning this giveaway, I really wanted to share his entry as, sometimes, it’s worth noting the good people do. Donnie Brooks (red jacket in the middle) with a group of people with a mini disc golf basket. I usually do not boast about the good things done. I feel that it messes with the karma of doing good. But since it is a requirement, I will throw a couple out there. I have spawned the sport of Mini Disc Golf and have personally promoted it in many countries. Japan, Australia, Canada, Costa Rica, and the United Kingdom to name a few. I have literally given away hundreds of discs in Costa Rica alone. I have brought the sport (with the help of the MDGF members) to the world stage. Also we have done many charitable events to benefit local food banks, families in our area,and area disc golf courses. Enough said. Let me take this time to personally thank Donnie — and every single one of you who submitted an entry for this giveaway. It really is nice to see so many people giving back to this sport that so many love! Finally, it’s time to get the winner for the social media package. These are some awesome items in this package, too! We received a whole heap of entries on this one, which doesn’t surprise me with the way social media is. So, let’s see… who won? The winner is — Chris Pappadackis, who was selected via Random.org’s randomizer! Congrats! Get me an address so I can send out the package! Thanks to everybody who entered these contests. I wish I had more to give to everybody, but stay tuned and we will be having more giveaways soon! For all you winners — e-mail me your address so I can get these packages out in the mail! Thanks again for the giveaways and Happy New Year!